I have always loved tea. I remember when I was growing up, my dad had a cup of hot Lipton tea almost every night before bed. Somewhere along the way, I joined in on this routine. The warm beverage was so soothing and helped me relax before heading to sleep. While I drink more coffee these days, I still enjoy tea. Coffee helps me get ready to seize the day, yet tea is the complete opposite. It helps me relax and unwind. 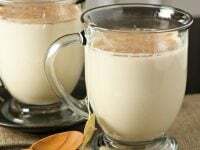 I’ve had a number of earl grey tea lattes from Starbucks, but it is really nice to be able to make these at home. That way I can stay in my pajamas, cuddle up with a blanket, and just enjoy. It took some fiddling to get these just the way I like them, but I’m finally completely happy with the result. I make these lattes much more frequently now that it is cooler outside. There is something about them that makes me think of the holidays. So the next time you need to unwind after a long day, spend about 5 minutes making one of these – it will make your night that much better. 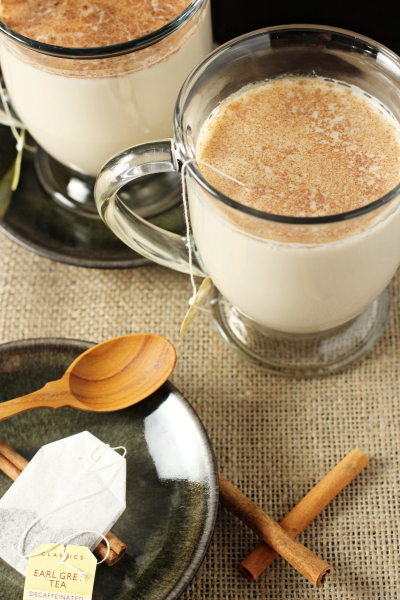 Recipe for earl grey tea latte. 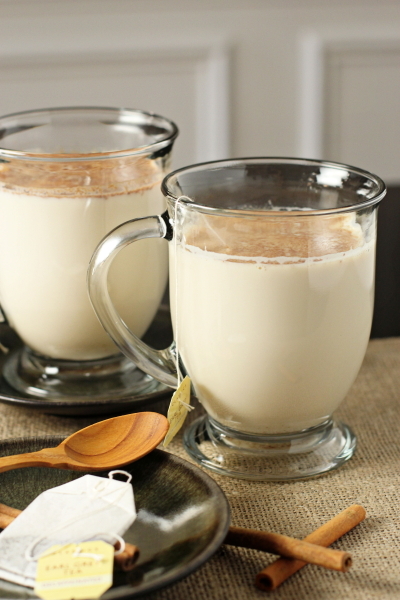 Make this coffee shop beverage at home! Save yourself some money and a trip to the store. Add the tea bag to a mug and pour in the boiling water. Let steep for about 2 to 3 minutes. Remove the tea bag. Meanwhile, add the milk to a small saucepan set over medium heat. Heat until just steaming (do not let the milk boil). Alternatively, you can heat the milk in the microwave. Add the milk to the mug and stir in the vanilla syrup. Top with a sprinkle of cinnamon and enjoy. If desired, you can whisk the steamed milk until very frothy before pouring it into the mug (or use a milk frother). I just prefer these lattes without the foam. *If you do not have vanilla syrup, you can substitute a teaspoon or so of regular granulated sugar and a splash of vanilla extract. Adjust the quantities to your own taste.